Text – Default – Used quite often. Love the chat view. Want to send to multiple recipients though and forward. But can’t. Calender – Default – Syncs with iCal. Contacts – Default – Could probably be moved as contacts can be seen via Phone app. Evernote – Free – Captures text, image and audio notes. Syncs to the cloud and back to desktop app’s. Holds my notes, FAQ’s, idea’s and reference files like hex colours, desing guidelines, code snippets etc. Used daily. 1Password – Free – Syncs with the 1Password desktop client. Stores passwords, online identities and secure notes. Maps – Default – Excellent and used far more than expected. Has been used more than once to find hotels when I was lost. WeatherPro – £2.39 – Replacement for the fairly poor default weather app. 10 day forecast, detailed stats on current conditions, satellite and radar animations for the UK, support for multiple locations and graphs. Lots of graphs. Ideal for the weather stat whore. Yep, me! Clock – Default – Has a few functions but only used to get to alarms. I should really it from front page. Weightbot – £0.59 – Does one thing but does it oh so well. It tracks your weight and hence BMI. It’s on the front page as a nice way of reminding me to keep on with the weight loss and also to get easy access to a nice graph showing progress so far. It limits you to entering weight data up to a year ago but resetting the date on your iPhone allows you to enter more. It also backs up your weight data just in case you lose it. Settings – Default – For changing settings and turning off wi-fi etc. Used often. Tweetie – £1.79 – Best app on the iPhone for twitter. Trend searching, friend adding, follower searching, nearby tweets in an interface that’s faster than any other. Love this app! 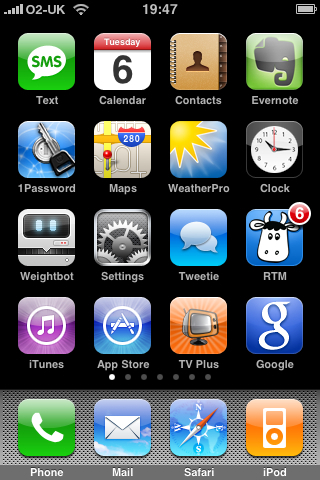 RTM – Free (but needs pro subscription costing $25 a year) – Superb companion app to the Remember The Milk website. I put all my tasks through this app and it really helps me keep on top of work and home commitments. Can’t recommend this app and website highly enough. iTunes – Default – Access to the store where you can buy music and download podcasts. Hardly used so I’ll be moving this off the front page. App Store – Default – Key to much of the iPhones 3rd party app explosion. Access the store from this one app. You can download and buy app’s from here and it will also check for updates, keeping your applications fresh and up to date. In some ways it’s too easy – don’t really know (or want to know) how much I’ve spent on app’s so far! TV Plus – £2.99 – Browse UK TV listings for Sky. Killer feature – send remote record requests direct to your sky box. Best app of this type at the moment. Google – Free – Google voice search (which only works well with an American accent), Google search and quick access to many of Googles features like mail, reader etc. Bloomberg – Free – Share info, market data and business news. Far more informative than the default shares app and far quicker than browsing the web for the same info. Presentation in this app is excellent! Twittelator Pro – £2.99 – Bought this on a recommendation from Shakeel. Was good at the time but recent updates made it worse, not better. Poor interface compared to Tweetie. Will be deleting. Now gone! Locly – Free – Great app for finding services close by based on your location. Garages, supermarkets, restaurants, pubs, banks, flickr images, wikipedia entries etc. Very handy and best of all free. 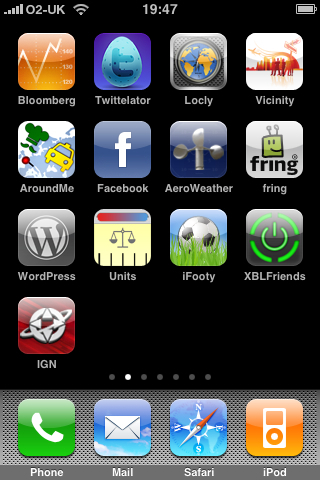 Vicinity – £1.79 – One of the first apps I bought and does the same as Locly, except not as well. Until a recent update it brought back far less results and options compared to Locly. Now it’s much the same but Locly is free and so the app to get. I should really remove this. Aroundme – Free – Similar to Locly but again not as good. Time to delete. Facebook – Free – Fantastic app for accessing Facebook content. I prefer this to the website but I don’t have many Facebook app’s installed so that may be an issue for others. Aeroweather – Free – Reports back latest weather readings from any number of airports around the world. Used to use this quite a lot but the recent purchase of Weather Pro has made it less useful. Will keep it but move it back a page. Fring – Free – Great IM tool for MSN, AIM, Yahoo, Skype etc. I found this the best and most stable of the free IM tools. Current version supports free VOIP calling – next version will support Skype calling. 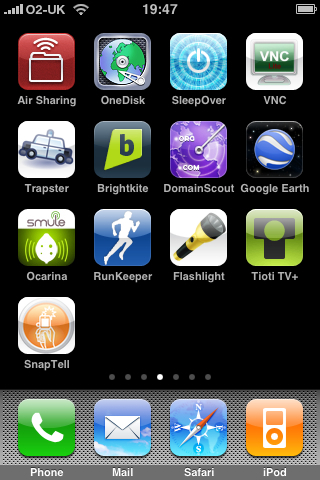 WordPress – Free – Allows you to manage your blog from the iPhone. Limited comment management at the moment but apart from that it works well. Units – Free – Allows you to convert from one unit to another. iFooty – Free – Uses BBC Sports content to display footie news for UK teams and leagues. Like many other app’s it’s easier to use this than it is to get the content on the BBC website. XBLFriends – Free – See who’s online on Xbox Live. Very slow to update friends list. IGN – Free – Quick access to latest game reviews from IGN. Handy with support for video reviews – annoying sound plays on start-up though! Camera – Free – Use this to take photo’s. The camera is pretty poor and why such a tiny virtual button? Photo’s – Free – View your camera’s photo roll and any albums sync’d from iPhoto. Simple but nice way to browse photo’s. Darkslide – Free (ad supported) or £2.39 – Access your Flickr photo’s, your contacts and photo’s taken from nearby your current location. Latest versions are much improved on early effort’s and it’s now much faster to use. You can also access your group photo’s and also places. Allows you to access so much of your Flickr content that it’s hard to fault – except I’d love to swipe between photo’s to browse. Newest update also introduced photo uploading to Flickr. Klick – Free – Another Flickr browser with an interface that I think is better than Darkslide but is let down with less search options. Movies – Free – Shows what’s on at local cinema’s (with timings) again based on your location. Also shows map to cinema for when your travelling. Trailers for movies (blocky) and release dates (US I think). Handy. 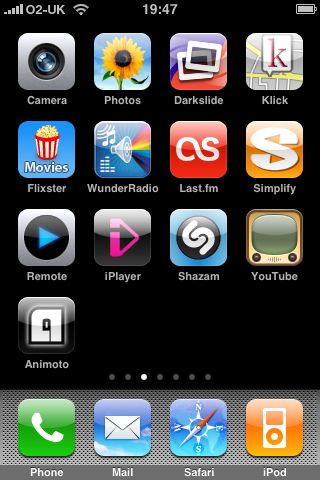 Wunder Radio – £3.49 – Best radio app for the iPhone. Massive directory of stations from around the world including most of the BBC streams plus Real Audio support that unlocks even more BBC streams. Check if the station you want is available here. Last.fm – Free – Free music streaming over wi-fi and 3G. Great way of finding new music. Highly recommended and still impresses me every time I use it. Who needs a big disk when you’ve got this? Simplify Media – £2.39 (free when I got it) – Stream music from your home Mac or PC’s iTunes library. You can also add friends so that they can browse and listen to your library…and vice versa. Very impressive although not used often. Remote – Free – Control iTunes playback on the Mac from the iPhone. Pity it can’t stream to the iPhone. iPlayer – Free – Shortcut to the iPlayer website. The video playback of iPlayer content on the iPhone is superb and this is great for late night catch-up of TV. Works over wi-fi only. Shazam – Free – Play some music and it will try and tell you what it is. A bit hit and miss, with the misses sometimes being quite funny. Youtube – Default – Browse and playback Youtube content. Works fine but not used often. Animoto – Free – Only just installed – select some pic’s and a soundtrack and it will create a video for you to share online. First tests have worked well. Air Sharing – £2.99 – Connect to the Mac over wi-fi and share files. Files can be later viewed on the iPhone. Handy but find I get more use out of Evernote than this app. OneDisk – £4.99 – Allows you to view documents on MobileMe or any other iDisk (like box.net). I also connect to my web space using the app. Handy but quite buggy and I’ve been disappointed with stability so far. Can’t recommend it to others despite it’s potential. SleepOver – £1.79 – Lets me wake my Mac using Wake over Lan (WOL) and Wake over Internet. My router is set-up to forward magic packets to my mac which lets me wake up my Mac from anywhere in the world – or Heathrow airport! Mocha VNC Lite – Free – Once my Mac is awake I can VNC to it. Sounds crazy for such a small screen but it works surprisingly well. Trapster – Free – Community based alert system for speed traps, red light camera’s etc. It’s ok but lack of user base makes it pointless in certain area’s. Coverage for Glasgow isn’t too bad though but then when you know the area you don’t need an app like this. Brightkite – Free – Allows you to sign in to locations and broadcast where you are – location based social networking. Not been impressed with it really. Time to delete. Domain Scout – Free – Easy way to check for available domain names. Google Earth – Free – It’s Google Earth for the iPhone and a great demo app for showing people what the iPhone can do. Ocarina – £0.59 – Blow into the mike and play the Ocarina. Listen to peoples efforts form around the world. Pointless but fun. Runkeeper – Free – Use it to track my walks using GPS. Been reliable so far. Flashlight – Free – Turn your iPhone into a torch. Used once or twice. Please don’t buy one of the non free torch app’s when this does exactly the same thing for free. Tioti TV+ – £1.79 – Another TV listings browser with support with remote record. It has a great now and next view but supports less channels than TV Plus. Links to iPlayer for BBC programs that are available. It also suggests programs based on those you like. Has so much potential but needs better channel support. Currently TV Plus is the better option. Snap Tell – Free – Take a picture of a cd, dvd or book and the app will tell you the best online price it can find. Currently does not support UK but that will allegedly come in a future upgrade. Accurate on the media I tested – one to watch. Google – Free – Link to Google website. Will delete as app replaces this. Flickr – Free – Link to Flickr mobile site. Very impressive and could easily replace an app. Notes – Default – Use Evernote instead of this. Hate the comic fault. Stocks – Default – Not used. Shame I can’t remove the default app’s that aren’t used. Livestrong – Free – Calorie information on lots of different foods. MyRail Lite – Free – Amazing app that will show you local train stations and also train timetables and how late the current trains are running. Don’t use trains often but I think this app is excellent and very handy to have on the iPhone. ProPol – Free – Turn an iPhone snap into a polaroid. Simple app but pretty effective. Seadragon – Free – Microsoft’s first iPhone app and a great tech demo. Zoom in from a massive distance on a variety of different images. Works best on wifi. Twitterrific – Free (ad supported) or £5.99 – First Twitter app I bought. Works well but Tweetie blows it away especially when you compare price. Rumours of a v2.0 though that will try and address shortfalls and DarkSlide support keeps the free version on my iPhone. Weather – Default – No longer use the default weather app. Calculator – Default – pretty nice calc app which I’ve used once. Monkey Ball – £4.99 – First demo that really showed off power of the iPhone. First app that I bought for the iPhone. Great demo app for showing off the iPhone but it can get quite tricky. Later version at least saves where you are as I got a bit hacked off at having to start over. However the graphics are very good and if this was released on the PSP I don’t think anyone would mind the graphics. Wurdle – £1.19 – Addictive word game. This is my goto game if I’ve got a spare 5 minutes. Trace words in a grid – it’s that simple but the game is done so well, and it’s so suited to a touch interface that it’s a joy to play. Virtual Pool – £1.19 – Its 3D pool with a good interface and mostly accurate physics. It’s got a good career mode and it’s a game that I really enjoy playing. Couple of little niggles I have is around how accurate the physics are when cuing over ball – it’s just wrong what you can apply to the ball in certain circumstances but overall a great game. Fieldrunners – £2.99 – My favourite iPhone game. Tower Defence on the iPhone. Great graphics, simple to play, tactically very deep and again a great touch implementation. Games can take a LONG time though but it does pause the game when you leave the app. More towers are promised (and hopefully more maps) in future updates so a long life is guaranteed. If you buy one game, make it this. And Wurdle. It even made Edge magazines top 30 games of the year which is pretty impressive. MotionX Poker – £1.79 – Play poker with dice. The dice are nicely animated and again this was a first day purchase that I still enjoy today but it can get repetitive and I can’t really recommend buying it ahead of so many other great games. If you want to see the dice animations (which are lovely) check out MotionX Dice. Texas Hold’em – £2.99 – Lovely poker game from Apple. Recommended. Live Poker – Free or £5.99 – I use the free version of this to play live poker (but not for money) with facebook or Live Poker players. Crashed a couple of times but generally works well. Solitaire Top 3- £2.39 – It’s Solitaire. It costs money. It’s not worth it! Real Football 09 – £3.49 – Pro Evo for the iPhone. Not quite but better than I expected. Good 3D graphics, slightly tricky controls via the virtual dpad and buttons on screen and it comes with the FIFPRO license so 198 teams with proper names and players. When you look at what comes with the game it’s amazing value. Also has local multiplayer. If you like football I’d expect you to like this game. Enigmo – £1.19 – Great physics based puzzle game but the controls can be fiddly. If you tough it out your rewarded with some challenging levels. 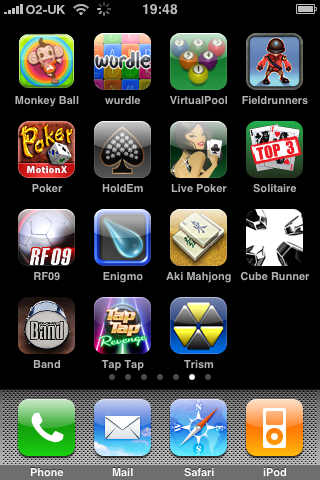 Aki Mahjong – £2.99 – I love mahjong games and this is my fav on the iPhone. Lovely graphics and sound and a tough challenge as you progress through the game. Recommended. Cube Runner – Free – Simple flight game – guide your ship by tilting the iPhone. Works well and is pretty addictive. Just noticed there’s a Cube Runner II on the App Store. Click ‘Buy’. Band – £2.39 – A first day purchase that was based on a great demo and a desire to own the app….with which I’ve done nothing. It is a great app but if I could get one refund it would be for this as it’s pretty pointless for me. Tap Tap Revenge – Free – Guitar Hero for the iPhone. Tap along to the song with a number of difficulty levels and songs. There’s also a challenge mode and also online play. Pretty slick. Trism – £1.79 – A puzzle game in the Tetris or Bejeweled style and one that plays well. Polished with great presentation and achievements to unlock. Recommended. rRootgae – Free – Top down shooter that reminds me of Everyday Shooter. Simple graphics but the screen gets very, VERY busy. Deep Green – £4.99 – Gorgeous game of chess for the iPhone. Damned hard too. Interface is one of the best on the iPhone. touchPhysics – £0.59 – A really tough physics puzzler. Draw shapes with crayons to move a ball. Sounds simple and is but some of the puzzles get very challenging. 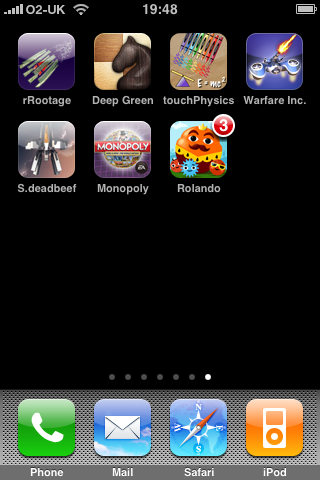 Warfare Incorporated – £2.99 – Red Alert for the iPhone. This was a close second for my favourite iPhone game. Great graphics and gameplay again suited really well for the touch interface. 20 story missions and loads of add-on missions and 2-4 player multiplayer coming soon. Buy it! Space Deadbeef – Free – Think R-Type and this is it. Controls can be awkward though and it can get tough. Monopoly – £2.99 – Plays really well although the animations can get a bit grating. But it’s Monopoly – what is there not to like? One hint – this is a world edition so it’s not got the traditional place names which is a shame. Rolando – £5.99 – PSP quality game for a phone…and for only £5.99. A game that has all the polish of a console title and I love it. So much better than LocoRoco which everyone (follishly) thinks this is. Buy it! Frenzic – £2.99 – Bought this only a couple of days ago and it’s a favourite already. Arcade puzzler is probably best description. Addictive! Phew. Done. Surely nobody is still here – the App Store is waiting. The app has been withdrawn from the App Store for legal reasons. A real shame as it was excellent. Looking at the twitter stream it seems they are trying to get back on the store – here's hoping. This might be a good alternative – iRail.